1、Ready to enjoy your wine? perfecting wine accessories and we've designed the ultimate wine opener for novices and experts alike.So, no more wining about tough-to-open bottles. and it's your fate to be a proud, lifetime owner of your own elephant Wine bottle opener! 2、Here's Why Elephant Wine Bottle Opener Will Be The Last One You Will Ever Need! •Premium quality metal construction bottle opener! • Easy to use and uncork a bottle of wine in seconds. •Ergonomic handle for sturdy uncorking performances. • For red or white wine, champagne and other drinks! • The best gift proposal for all wine lovers! Comes in a gift package! just contact us to refund or return. RISK-FREE! What are you waiting for? Get yours today Scroll Up & Click Add To Cart Now! Material: Zinc alloy material with plating, durable and attractive. and the design is accordance with human engineering. Structure: Design based on classic lever and grip, the legendary smooth lever action is based on the idea of mechanical advantage. 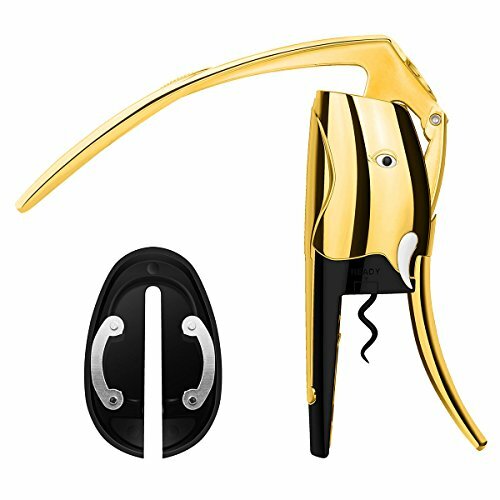 As pressure is applied at one end of the lever handle, elephant shape makes power easy multiply at the corkscrew, making it easier to open the bottle with one fluid motion. Easiest corkscrew to use:Five short steps and one second is all it takes to open any bottle of wine. Open one bottle or multiple bottles for a party with ease using the best corkscrew available, and never worry about a broken cork again. If you have any questions about this product by FS.FCM, contact us by completing and submitting the form below. If you are looking for a specif part number, please include it with your message.